I haven't done a fermented sausage either. Supposedly, you'll need to keep the sausage in a warm place for a couple days to get the culture "going". An unlit oven has been suggested by some... Your cellar sounds perfect for hanging the sausage to finish curing and dry. Ruhlman sez to keep it someplace ~ 80 deg F for 12 hours, so I put it in our oven with the oven light on. It felt somewhat warm to the touch when I took it out this morning. Talk about being counter-intuitive. Raw meat left overnight in a warm place. The first sausage batch is always a fun party for me and the crew, lots of food, beer, wine, and laughter. No kidding. That's a hell of an operation you ran there. Sounds amazing ! Just finished stuffing my garlic kielbassa and now it's curing in the cold garage. Temps won't get over 45 today and I doubt the garage will change much. Goes for a cold smoke after work tonight. 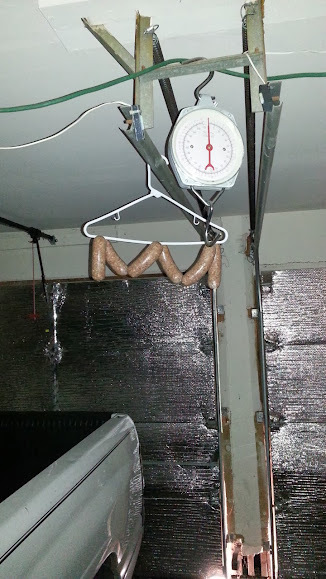 Been searching for a cheap and easy way to hang wet sausage without it unraveling, Guess I found it! Not easily skeert, but ^^ is so inciduous! Well it is freshly made but not "fresh" since I included sodium nitrite in the recipe. This helps preserve the inside. A good smoking will preserve the outside. And then I could vacseal them as is and freeze or poach them post-smoke to 150*. This can be done pre or post vacseal and the cured sausage will keep for months in the fridge. If I was really ballsy I'd use sodium nitrate and hang them post-smoke all winter in the garage.